LAS VEGAS -- Dustin Poirier dealt with Max Holloway's standing onslaught for close to two minutes. That's when he had enough. Time for Plan B.
Poirier took the fight to the ground and taught the 20-year-old a lesson. He mounted him, tried an armbar, switched it to a triangle and then wound up getting the submission finish with a nifty armbar from a topside triangle at 3:23 of the first round at UFC 143. Give Holloway some credit. He took the fight on less than a month's notice against a guy who's one of the brightest prospects in the division. 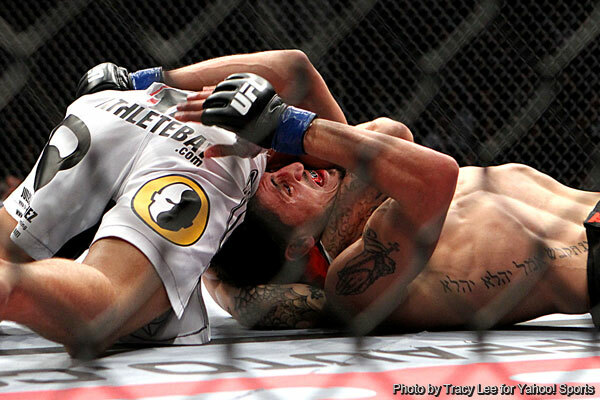 Poirier's finish is currently the lead candidate for Submission of the Night. That could be good for $65,000. UPDATE: Poirier got the nod for Sub of the Night and the $65,000. "I never underestimated Max. I was in his shoes before. He's a tough fighter and good kickboxer. He was quicker than I expected though and hit me with a few shots," Poirier said. "I came here to get a win, and I got the finish. I'm one step closer to being a champion." Holloway's standup attack was pretty slick. Working behind both hands, some flying knees and plenty of kicks, he had Poirier on his heels. Poirier went for his first takedown with 3:06 left. He got it easily and lifted the slim Holloway into the air before slamming him to the floor. He moved to mount immediately. Poirier simply overpowered Holloway on the ground pinning his arms down on several occasions.